The purpose of this project was to demonstrate the capabilities of an existing watershed model and downscaling procedures to provide simulated hydrological data over various greenhouse gas emission scenarios for use in the Methow River framework prototype. An existing watershed model was used to simulate daily time series of streamflow and basin-wide hydrologic variables for baseline conditions (1990–2000), and then for all combinations of three greenhouse gas emission scenarios and five general circulation models for future conditions (2008–2095). Input data for 18 precipitation and 17 temperature model input sites were generated using statistical techniques to downscale general circulation model data. The simulated results were averaged using an 11-year moving window to characterize the central year of the window to provide simulated data for water years 2008–2095. Simulation results indicate that substantial changes of monthly mean streamflows will occur. For all greenhouse gas emission scenarios, the future streamflows are greater in the winter than baseline conditions because a greater percentage of future precipitation is projected to fall as rain rather than as snow. The simulated future spring streamflows are less than baseline conditions because the spring snowpacks are smaller; therefore, flow contributions from snowmelt are less. A database was developed to automate model execution and to provide users with Internet access to voluminous data products ranging from summary figures to model output timeseries. Database-enabled Internet tools were developed to allow users to create interactive graphs of output results based on their analysis needs. For example, users were able to create graphs by selecting time intervals, greenhouse gas emission scenarios, general circulation models, and specific hydrologic variables. 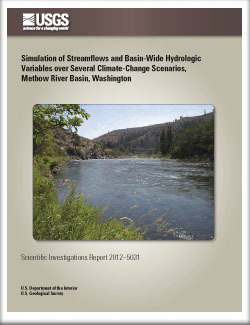 Voss, F.D., and Mastin, M.C., 2012, Simulation of streamflows and basin-wide hydrologic variables over several climate-change scenarios, Methow River basin, Washington: U.S. Geological Survey Scientific Investigations Report 2012-5031, 18 p.